Recently, Innjoo came up with new flagship smartphone, Innjoo One. 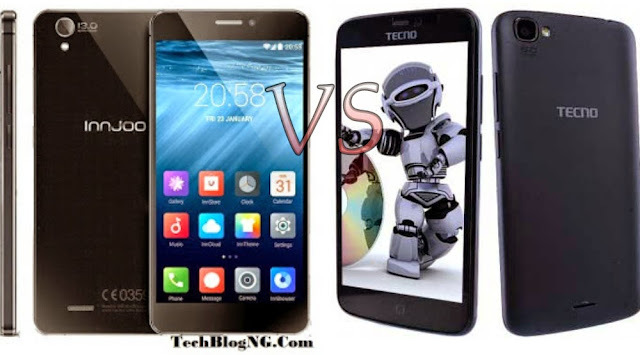 This smartphone have greater features and am really impress with it, so it’s time we compare the smartphone with the previous smartphone from Tecno which is Tecno L6. Both smartphone features 3G network. Both smartphone also uses dual sim with Innjoo using one micro sim and one Nano sim while Tecno L6 uses dual mini sim. Although there’s still rumours that Innjoo may produce Innjoo One with 4G feature and expandable Internal Memory. Innjoo One is pretty with full Metal Frame and a Sleek Design, 6.99mm thick, the metal frame combines with though glass cover on the front and back to give the smartphone a premium look and feel while Tecno L6 has a cutting edge design that makes it easy to hold and explore. Innjoo One features 5 inch, 720×1280 pixels brilliant HD display while Tecno L6 is built with a 5.0 inch (480×854 pixels) PPI display screen which would makes them easy to navigate through and provide high quality pictures and videos. The new Innjoo One is build for high performance sporting a Mediatek chipset with 8 cores, each clocked at 1.7GHz while Tecno L6 features Quad Core cortex -A7 CPU processor each clocked at 1.3GHz. Innjoo One features Mali-450MP GPU while Tecno L6 have the Mali-400MP2 GPU. With this processor comparison, it’s definitely sure the Innjoo One performs better and faster than the Tecno L6. Both smartphones runs on Android 4.4.2 Kitkat OS but there is difference in the RAM, Innjoo One with 2GB RAM and Tecno L6 with 1GB RAM. Both smartphones also have other features like bluetooth , micro USB v2.0, A-GPS, wifi 802.11 b/g/n, and WiFi Hotspot. The Innjoo One is built with 16GB Internal Memory with External SDcard slot with capacity of about up to 64GB while Tecno L6 have internal memory of 8GB but with external sdcard slot up to 32GB. Both smartphones were really good for taking shots Innjoo One featuring a 13MP Rear/Back Camera and a 5MP Front Facing Camera while Tecno L6 was built with a Back Camera 8MP and 2MP front facing camera. Both smartphones cameras are clear and sharp with LED flash light for Night Shots but the Innjoo One Camera is the best option in this category as it is more clearer and sharper then that of Tecno L6. Innjoo One features just a reasonable battery life of 2600mAh compared to that 4500mAh battery of Tecno L6. Therefore, Tecno L6 has a better battery life than Innjoo One. For Nigerians, both smartphones are available in Nigerian Largest Online Markets dealing. But it’s advisable to purchase from JUMIA as they deliver faster. You can get the Innjoo One from JUMIA for N27,999 while Tecno L6 sells for N24,000 on Konga.